Strawberry Vodka! Now that sounds spectacular! This little gem was making its way around Twitter about 2 weeks ago. I first spotted it on David Lebovitz’s blog ~ living the sweet life in Paris. I knew immediately I had to try it. I followed the same direction as David, letting mine sit for 5 days. You will need a 2 pound clamshell of berries, 2 large jars and one 750 ml bottle of vodka. I admit I grabbed the Absolut Vodka strictly for the nice clean bottle. Now that I have tasted the finished product I do not think the type of vodka will affect the final flavor. The strawberries are very pale so it is time to strain the fruit from the alcohol. I used coffee filters to get a nice clean finished vodka. Straight is nice on ice though I prefer it mixed with a splash of Club Soda. The touch of sweetness from say 7 Up would be a nice addition. The strawberry flavor is very prominent and it has a nice smooth finish. Next Post - Next post: Gord Downie and The Country of Miracles. Ellen was the photographer for the cookbook shoot, I was referencing her *touch* of garnish for the drink! I will have to look for that Firefly Vodka next time I am at the store. 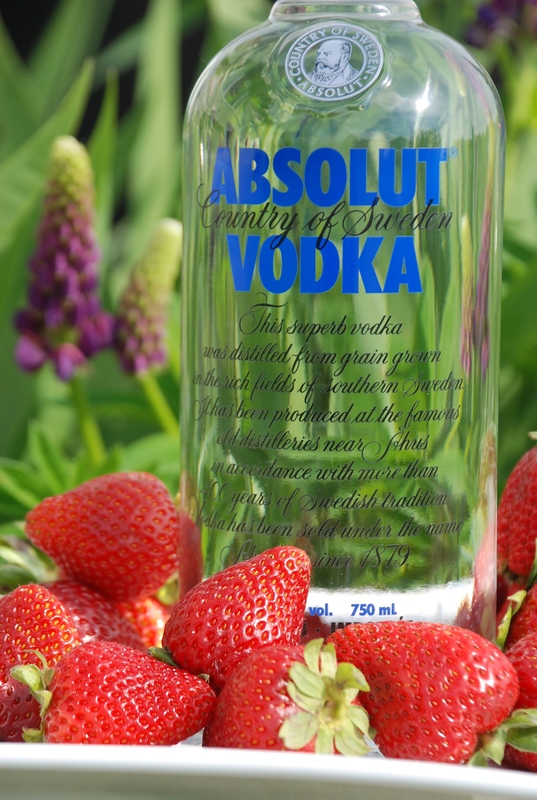 This strawberry vodka is very good, much better then I had antisipated, it really took on all the qualities of the fresh berries! If you have some extra stawberries give it a try, you will not be disappointed! Looks awesome! needed some of that on the cruise 🙂 Have you tried Firefly Iced Tea Vodka or Lemonade? It’s great too! Funny now that I have my this recipe, I seen another for a blueberry infusion! I bet cherry will be fantastic! I’m going to experiment with some fruit vodkas when I’m back home. Cherries would be great I think. Like the step by step photos. So much better then I had expected. I can see this bottle not lasting too long. If you like strawberries, give it a whirl! You could use it in a lot of different applications! You defintely need to try iy Kyle! The worst part is straining it, use a colander if you have one and strain it into a big pot first. It is so smooth, I am plesantly surprised at how good it is! I’m sold! Seriously I am going to attempt at putting this together for next weekend. I have been looking for a new drink.